After days of preparation, of making sure we crossed our t’s and dotted our i’s, we left Avery Point, Connecticut at 1800 with overcast skies but calm seas. The goal of our trip is to deploy 5 HARPs (High-frequency Acoustic Recording Packages from SCRIPPS), recover 3, and recover, refurbish, and redeploy a noise reference station (NRS, PMEL and Oregon State University). All recorders are off the shelf break, from New Jersey up to the tip of Georges Bank. The HARPS are capable of recording sound from many species including baleen whales, sperm whales, beaked whales, and dolphins. The five that we will be deploying, as well as the three that were out, are part of the Shelf Break Acoustic Ecology project, which includes a total of 8 HARPs spanning Georges Bank to Florida. This is a combined effort of the Northeast and Southeast Fisheries Science Centers to understand biological activity along the shelf break before the planned seismic exploration starts off the United States’ eastern seaboard. The NRS serves a slightly different purpose, to listen to and characterize the ambient noise in the deep ocean. It is part of a larger project that is being conducted by NOAA Fisheries, NOAA Sanctuaries, and the National Park Service, to compare ocean noise throughout a number of sites within U.S. waters on both coasts and the Gulf of Mexico. By 0600 we were sailing through NYC. Skyscrapers, the Brooklyn Bridge, and the Statue of Liberty all greeted us and bade us farewell as we made our way out of New York Harbor. We had traveled down Long Island Sound, hugging the coast for as long as possible before making our way offshore. Today was a day of planning, of outlining how things were going to happen and where we wanted to deploy our units as we made our way full-steam down to the southernmost deployment site. We arrived at the site in the late evening with perfect seas, and dropped it off right where we wanted it without a hitch. Then it was full steam ahead to the next site. The sea gods were a bit rough with us at the start. Waves slopping on deck, boat rocking back and forth, a few of us fell prey to the rough conditions. But there were enough of us that despite what the weather threw at us, we still managed to get the second HARP out easily. Later on in the day the winds died down, and with it the whitecaps. We even managed to find a few pods of common dolphins, which took the opportunity to bow-ride our vessel, as well as some ocean sunfish sunbathing. Today was the first day in which we had to recover an existing HARP, and replace it with a new one. There was an air of excitement (and nervousness) about the vessel as there always is when calling out to an instrument that has been underwater for a year. In order to get the unit to surface, a burn signal is sent that when the release “hears” it, acknowledges and scuttles the weights, allowing the unit to rise to the surface. We all didn’t know how long it would take, and were surprised to see it at the surface in a mere 15 minutes. The unit had been down around 1000 m in depth! We carefully extracted the unit from the water and quickly deployed the new one that was to take its place. With the unit we recovered, we cleaned and pulled its guts out, taking the precious data collected on the hard drives and storing them in static-free bags to be analyzed once back at the lab. If that wasn’t enough of an interesting day, we also came across three sperm whales in which one raised its flukes to go on a deep foraging dive, and the other two were logging at the surface and traveling. Bottlenose dolphins kept us company for most of the day, and we also found a few puffins! The sun was high in the sky, temperatures were warm, the sea state was great, and some of the crew could be found on the deck enjoying the nice weather. Definitely a much needed reprieve from the weather the day before! The day started out much like the previous one did. We had taken the night to steam up to our northernmost HARP site to arrive just after daybreak for retrieval, which went without a hitch. However that was not the case for the deployment. The HARP that we had selected did not pass the deck tests we conduct before dropping it over; luckily we still had one other HARP on deck. We prepped that one and launched it right where the old one was. We tried to troubleshoot the problematic HARP, but ran out of time as we started to prepare for the NRS mooring that was to be recovered later on that afternoon. That mooring had been like an uneasy weight on everyone’s minds this past week, as it had 1.67 miles of line, not including the hydrophone, float, acoustic release, and anchor. We all referred to it as the “monster buoy”. Due to the skill of the crew and many recovery planning meetings, the entire mooring was up in 5 hours and went so smoothly, even with the building swells! By the time we were done, it was well into dark so we strapped it all down securely on deck to be deployed first thing the following morning. We spent the rest of the night replacing shackles and any other parts that looked to have some wear to make less work for the morning. Today was our first overcast day of the trip, but the seas were essentially the same as they had been. We conducted many deployment meetings to make sure that everyone knew what task they needed to perform, and how it was all going to work. By 0700 we were ready to deploy and despite everyone’s trepidation, the deployment went very smoothly, even with towing 1.67 miles of mooring for 5 miles. Including the time it took to tow the mooring behind us, the entire process took half the time it took to recover it. After the deployment, we set to work to ascertain just what was wrong with the last HARP. After a few phone calls to the manufacturers on the West Coast and completely taking apart the internal frame, we were able to solve the problem and get the unit working again. Things were back on schedule to do the recovery of the last HARP that had been in the water, and swapping it with the newly fixed HARP. But the weather kicked up and things weren’t looking very optimistic, which put a damper on our spirits. We decided to hold off the final decision of whether to recover the unit at the bottom until we actually made it to the HARP site. Once there, after a brief planning meeting, and weather check, we decided to go for it. And the decision paid off. We were able to recover and deploy our HARPs, fully completing our mission. By 1800 we were heading home. On May 29th, the Henry Bigelow reached the easternmost part of the survey area on the northeastern tip of Georges Bank. We are now continuing our coverage of Georges Bank and will venture into the Gulf of Maine next. 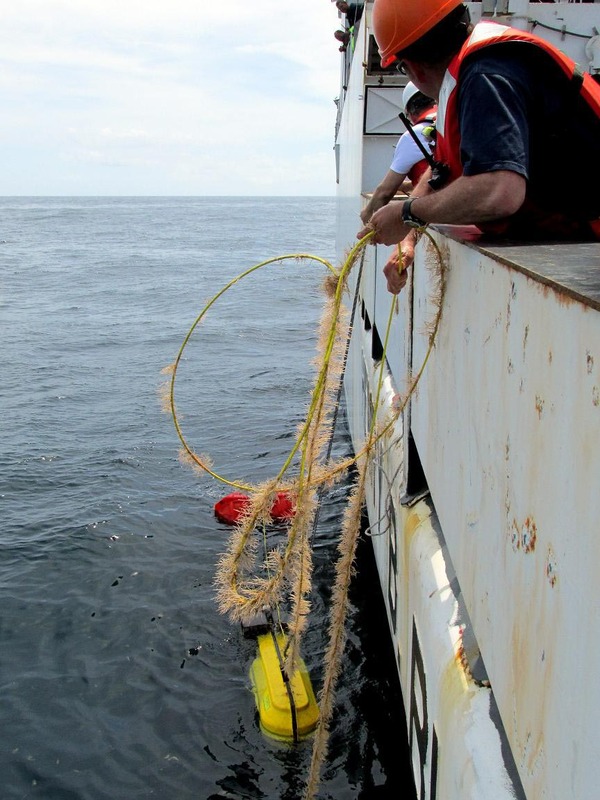 Survey Technician Geoff Shook lowers a transducer over the side to communicate with the submerged Autonomous Multi-channel Acoustic Recorder (AMAR) mooring. Photo by Jerry Prezioso NEFSC / NOAA. While working our way east along the southern flank of Georges Bank yesterday we made a stop at Lydonia Canyon to retrieve an Autonomous Multi-channel Acoustic Recorder (AMAR) mooring that had been deployed last summer to record whale sounds. With calm seas and sunny skies (but a fog bank on the horizon to add some drama) the retrieval went very smoothly. The ship pinged the recorder and received signals back indicating its distance from the ship. After maneuvering the ship closer to the mooring, a release signal was sent, and the recorder popped to the surface ten minutes later. AMAR unit on the surface after being released from its mooring on the seafloor. The yellow container has part of the unit inside while the red floats are supporting another component beneath them. Photo by Jerry Prezioso NEFSC / NOAA. After being spotted by our sharp-eyed WHOI scientist Emily Peacock, the command and crew worked together to reposition the vessel and scoop the recorder unit and two glass buoyancy floats from the water. The entire process took no more than two hours. This morning our NOAA Teacher-at-Sea, DJ Kast, launched two artistically decorated drifter buoys as part of the NOAA Global Drifter Buoy Program. 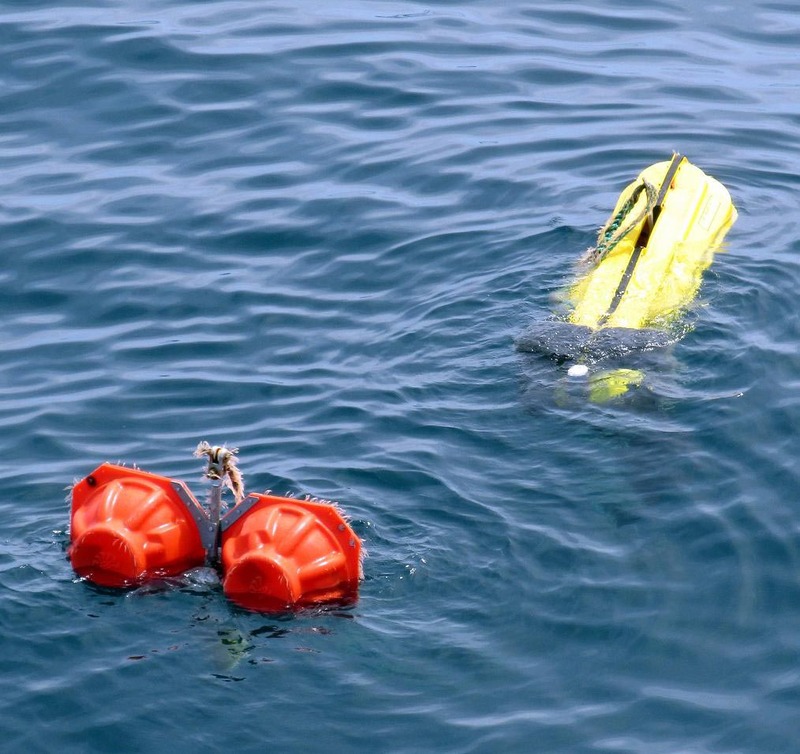 Equipped with a thermistor, an ARGOS satellite tracking system, and a transmitter, the buoy will send out its location and water temperature for over a year (about 410 days) before its batteries die out. A cylindrical drogue attached to a surface float that the teacher and students decorated will cause the buoy to be moved about by surface currents, not wind gusts on the float. 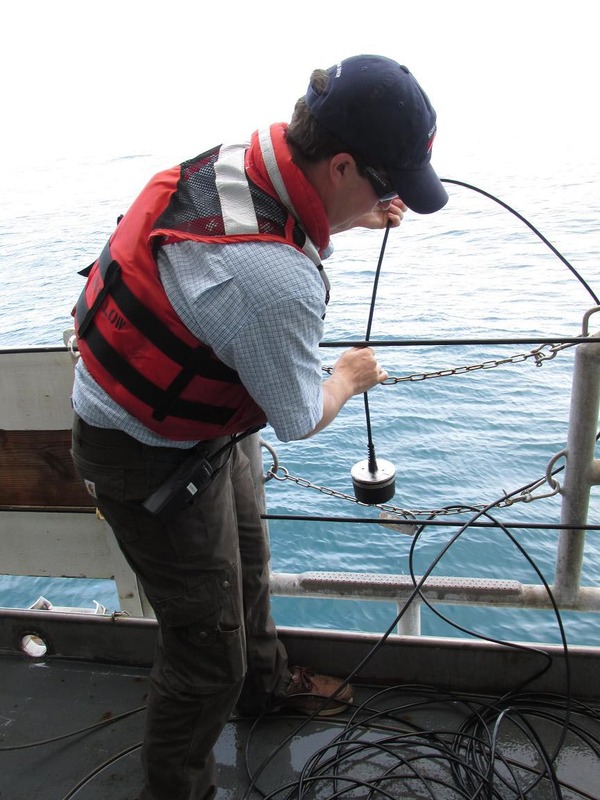 NOAA Teacher-at-Sea DJ Kast deploying the St. Joseph School buoy while we are on the northeast peak of Georges Bank. Photo by Jerry Prezioso NEFSC / NOAA. 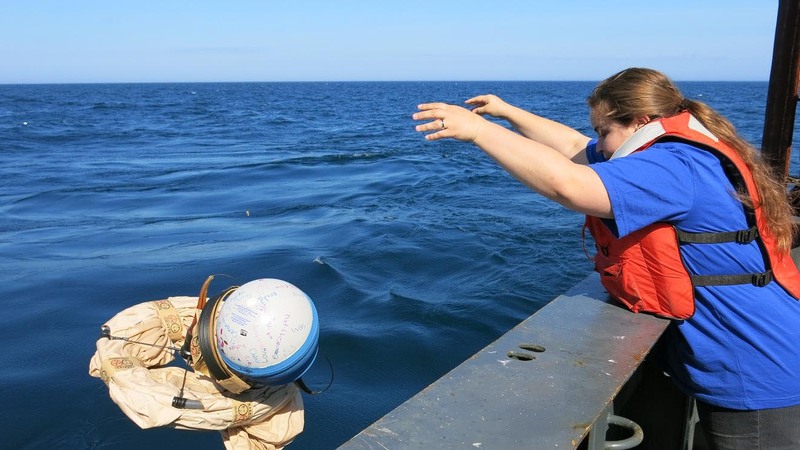 Students from a variety of public schools associated with a University of Southern California program and one parochial school, St. Josephs in Fairhaven, MA, will be looking online to follow the progress of “their” buoys across the ocean! 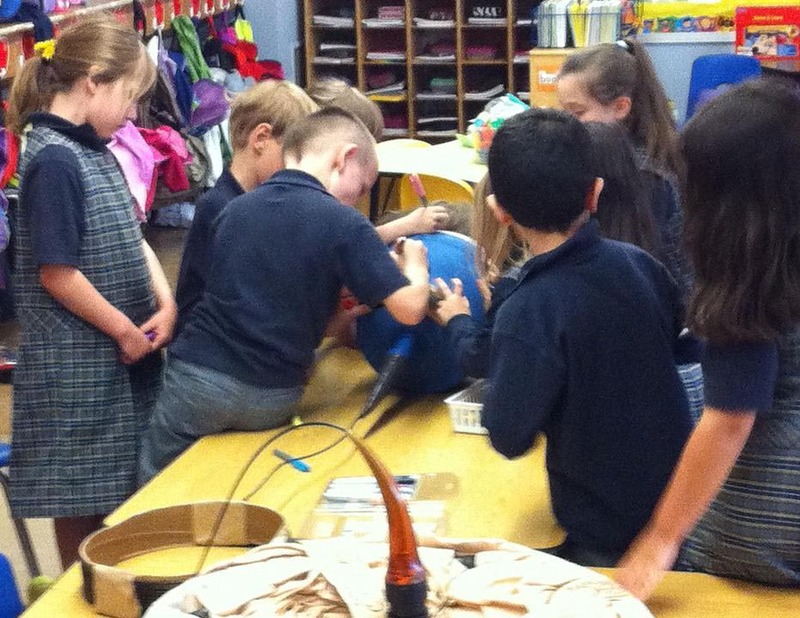 St. Joseph Elementary School students decorating “their” NOAA buoy prior to the cruise. Photo by Harvey Walsh NEFSC / NOAA. While on the southern flank of Georges the catches were full of phytoplankton, but now on the northeast peak this has dropped off. The present catches are mostly calanoid copepods and some gelatinous zooplankton, mainly Pleurobranchia ctenophores and an assortment of salps. We are still seeing an occasional Phronima amphipod in its salp shelter too! Our weather continues to be excellent which has been a real boon to our progress. We are currently heading for the shoal portion of Georges Bank before turning north to sample in the Gulf of Maine, which we will sample to the best of our ability in the time remaining.